You’ve said yes, there’s a shiny new diamond on your finger, and now it’s time for the excitement and planning to turn to, choosing THE wedding dress. Our Woodall Manor wedding planners are here to help you make the most important dress purchase of your life. Here are their top tips to help you find the one. With so many magazines, websites and even TV shows dedicated to wedding dresses, it’s easy to get completely swamped with ideas and choices. Try hard to look past the skinny models, and be honest about the type of dress that’s going to be the most flattering for you. If you’re lucky enough to have womanly curves and a gorgeous figure, then something clingy in satin is not going to be the most flattering choice and will only leave you feeling self-conscious. Think about the areas of your body that you like least and that you want covered, or disguised by your dress. You can also take inspiration from dresses in your wardrobe. If you always receive lots of compliments when you wear that dress with the low back, then take that into consideration when you’re searching for, the one! Beautiful beading around the hem is all well and good, but in all honestly, no one is going to see it bar you. Likewise a huge sweeping train is amazing if you’re marrying in a cathedral with a lovely long aisle, but a bit wasted on a civil ceremony taking place in the library of a period venue. When you’re signing the register, or enjoying your wedding breakfast at the top table, the top of your dress will be all that’s seen. Lots of the photographs, particularly those that your guests will be taking, will be of your top half only. So think about the detail and design of the bodice, and elements such as sleeves, belts and beading that will get noticed. If reality TV shows are to be believed, a bride needs a room full of people to choose her wedding dress, and you should be visiting each boutique with everyone from your bridesmaids, to your neighbours in tow. Don’t be drawn into this way of thinking. More people equals more opinions which will likely just confuse you and cause unnecessary stress. 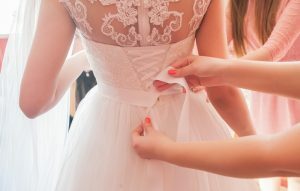 If you want a second opinion (bear in mind many brides go dress shopping alone and do just fine!) then take your best friend, or someone you trust to give honest opinions and be helpful. Don’t feel obliged to invite your mum, she may not be the best person to ask. We’ve heard of many brides who felt under huge pressure to choose the dress that their mum preferred. Even if she’s paying, it doesn’t mean that she gets to choose! It’s really important that you pick something that you’re totally comfortable with, and love to bits. For a single wearing, it’s a phenomenal amount of money to spend, so it’s essential you choose something that’s the best possible option for you. Fix your budget, and stand firm! Caught up in the romance and excitement it’s tempting to get carried away and order a dress that’s beyond your means. 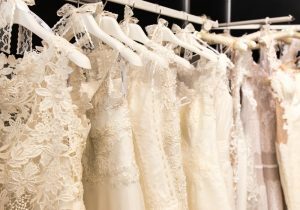 Canny bridal boutique managers will offer you glasses of fizz, and fawn over you in order to secure a sale, but the wedding dress is only perfect if it’s one that you can actually afford. A professional boutique will establish your budget at the beginning of your visit, and help you select dresses within that price range. While gossip magazines devote pages and pages to celebrity weddings where dresses that cost in excess of £100,000 aren’t uncommon. Flashback to real life… a wedding dress that costs as much as a house isn’t normal! Set a budget that you’re comfortable with, and that is realistic. Yes, your wedding day is special and you want to feel fabulous, but do you really want to still be paying for your wedding dress months or even years after your big day? We think not. Whichever dress you choose, you’ll be wearing it for an entire day so it needs to be comfortable, and also ever so slightly practical. We don’t want to burst your bubble of a fantasy fairytale dress, but if you can’t breathe out in the boned corset, then you’re not going to want to sit through a 5 course banquet and then dance for hours in it. The right dress will make you feel like you’re walking on air. You’ll feel comfortable, beautiful and confident. If the straps are digging into your shoulders at the fitting, imagine how you’ll be feeling when they’ve been on for more than 8 hours! Never convince yourself that ‘I’ll get used to it’ – it’s so important that you feel amazing from the minute you put your dress on. If you don’t, you need to keep looking as it’s the wrong dress! If you need some extra inspiration why not call Faye on 01394 411 288 to find out when we’re next showcasing wedding dresses at the Manor, and feel free to have a private viewing of our stunning venue whilst you’re here. Our magical exclusive use venue could be the dream setting for your wedding day. Alternatively drop us an email at info@woodhallmanor.com and we’ll get right back to you.